Dr. Ashley Wissink earned her Doctorate of Physical Therapy from Franklin Pierce University in 2018. She received her Masters of Public Health degree from New Mexico State University in 2015, where she also served as a Graduate Assistant & Women’s Soccer Coach. In 2013, she completed her Bachelors of Science degree in Biomedical Sciences from Grand Valley State University where she was a four year starter for the GVSU Women’s Soccer Team, leading the Lakers to their first two back-to-back NCAA national championships, while earning a multitude of personal recognition and awards at the local and national levels during her collegiate career. Dr. Wissink’s strong background in athletics, her love of learning and teaching, and competitive spirit led her to seek out clinical experiences across the world in order to gain valuable knowledge and experience working with orthopedic trauma injuries, and outpatient sports therapies and practice standards both in the United States and Australia. Ashley has a lot of interest in working in women’s health and recently has become a Pelvic Rehab Practitioner to further help her patients. 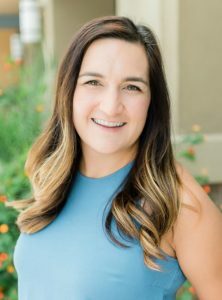 She has presented at national conferences on a variety of topics including myofascial cupping and is a member of the American Physical Therapy Association. Ashley grew up in the Midwest, but moved west to enjoy the weather as well as the many opportunities for hiking and other outdoor activities. Although, she’s a still an avid Wisconsin Badger fan! She, her husband, Rob, and their puppy, Ronnie, are expecting their first child in November. Ashley believes that movement is the key to health and wants to be able to help patients get back to the activities they love! !